We’ve been loafing all summer in steamy North Carolina, playing tennis in mornings or evenings. 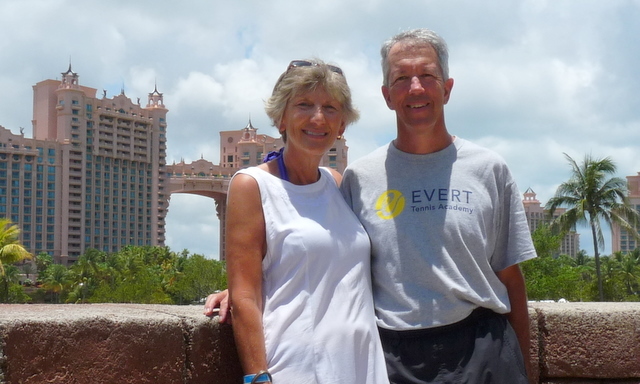 The mountains called us for a couple of weeks of cooler temperatures, we’ve spent a week in Myrtle Beach, a week in The Bahamas, and a couple of weeks in DuQuoin. And we accomplished very little on the truck or trailer. 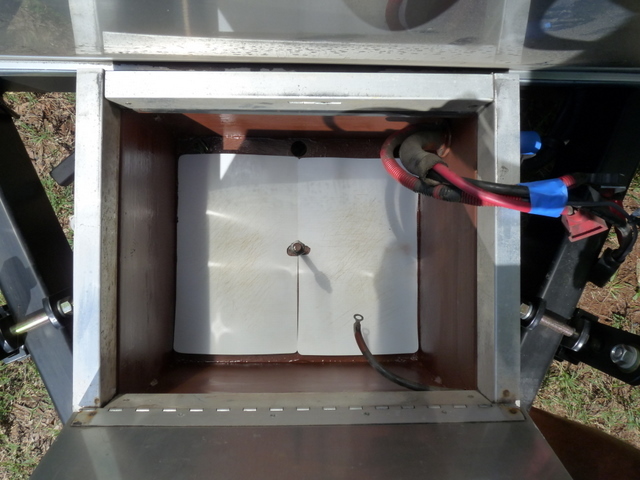 Jim put a couple of 3/4″ holes in the truck cab’s roof for his ham radio antennas. The improvement on antenna efficiency is fantastic, with standing wave ratio (SWR) at or near 1.1:1 on both antennas. Neither magnetic mount nor (of course) door edge mounting was nearly as good. Gosh, wish we had done this years ago! We replaced the tires and brakes on the trailer’s axles. The trailer was born October 2004, we’ve towed it five years and approximately 50,000 miles on the original brakes. Jim bought seals and complete brake sets (backing plates, shoes, springs, adjustors, magnets, all assembled) last year and decided then to wait a year to install. We took the drums to a local tire store (thanks, Brothers Tire Co in China Grove) for turning. The old brakes still looked okay although a little glazed. The new brakes are much stronger. Did Jim really paint this only two years ago? We refinished and tuned the trailer’s a-frame and Equal-I-Zer hitch. Escapees provided all wheel weighing earlier this year and demonstrated we could raise the hitch an inch or two to equalize weight between trailer axles. 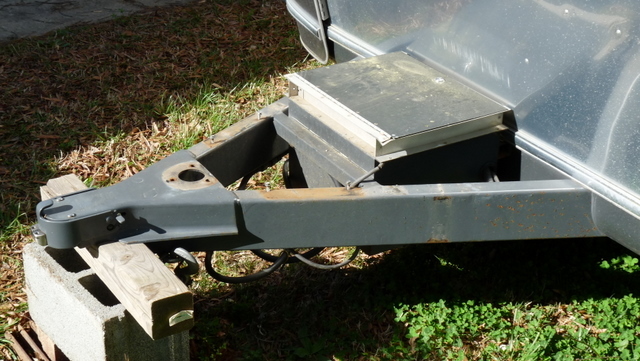 We removed the hitch completely from the trailer, disassembled and cleaned it. Some parts we took to a local shop for powder coating, the others (including the hitch head) we cleaned and spray-painted. Jim reassembled it all with grade 8 bolts (bought by the pound) from Tractor Supply Co. Progressive Mfg (Equalizer’s parent company) sent new decals for the load bars and sockets. 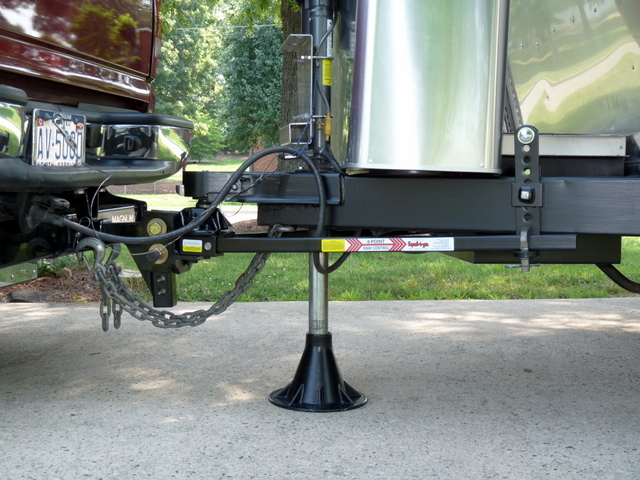 The hitch looks like new and, yes, the axles weigh the same now. Let’s see, and we played a lot of tennis and worked out at the local tennis club. But ignored the trailer other than these few chores. Summer is drawing to a close for us and we realized so is time to get projects completed before we hit the road for the year. Time to make a list of all the work we need to do while we are here. Our list ran the gamut from making new pillows to oil change. Then we assigned days for each task, filling four days with fun things we need to accomplish. The change on our focus and activities is remarkable and predictable. Suddenly we’re getting things done. Monday morning Jim removed the batteries and sanded and painted the battery box. This was a great opportunity to check the battery water level — Jim was surprised to add 8 ounces of distilled water to each cell (48 ounces total) even though the plates were covered with water already. 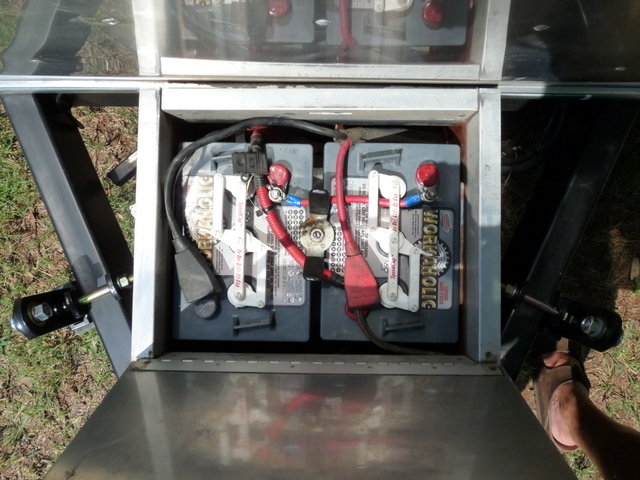 Before reinstalling the batteries he placed plastic cutting board under the batteries to prevent them wearing through the paint and exposing metal to corrosion. Monday afternoon we went to a couple of fabric stores and picked new pillow forms and fabrics to redo our interior. Deb made new pillow shams for the bed and new covers for the dinette bolsters. Jim tore down our portable ceramic heater to see if he could restore the missing airflow. It took very little time for him to dissect the heater and get to the heater core. The heater core was almost completely blocked with a dust mat. The heater cleaned up well and works great. 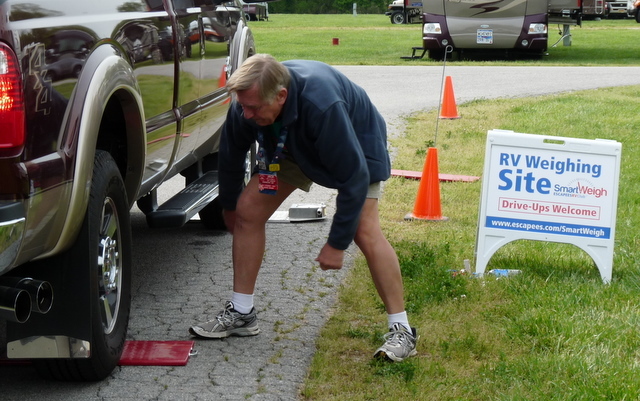 Then Jim had the truck’s tires periodic rotation, balance, and pressure adjustment done at Discount Tire. Tuesday morning we removed the charger-converter from the under-sofa power center to see if it might also be clogged with Chinle (AZ) dust like the heater. The charger-converter was surprisingly clean after two years’ service. Jim removed a little dust from the enclosure. 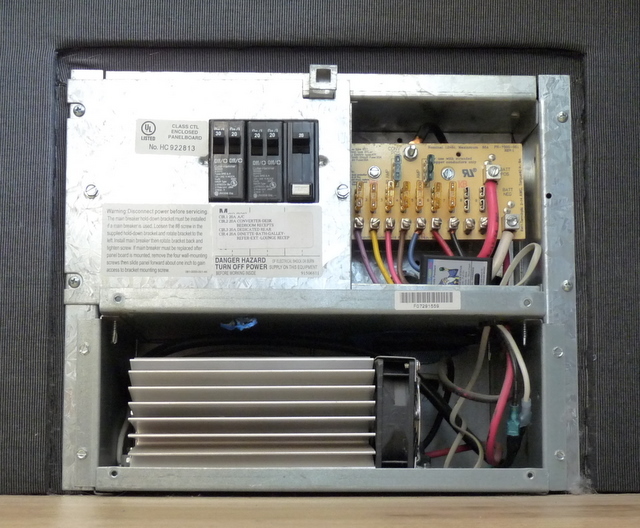 Since he already had disconnected and removed the device Jim decided to carefully rework all connections and attachments in the charger-converter and the 12vdc and the 120vac distribution panel. Tuesday afternoon Debbie completed the sofa pillows and started figuring what to do about decorative pillows for the bed and Jim made an oil change appointment for Wednesday morning. And three sets of tennis Tuesday evening finished Jim off thoroughly. Wednesday morning we dropped the truck for oil change and shopped for fabric for Debbie to complete three more throw pillows. We picked up the truck from Classic Chevrolet and took it to a local auto glass shop, Deal’s Auto Glass, both in Kannapolis. Last week our windshield took a hit from a BB, resulting in a nickel-sized chip. The glass shop did a great job filling the chip and we can’t find it. Hopefully this will extend the windshield’s life — we learned this morning we don’t have glass coverage in our insurance policy. Jim realized he had been procrastinating on a few jobs. The tasks list helped get him started again and broke down the big list of things to do into just one big job each day and a few easier ones. Wednesday afternoon he tackled what seemed like a big job but turned into a fun and pretty easy one. Months ago we had temporarily hung an LED light strip under the roof locker above our dinette. It served us well on our last boon docking trip, but the power was pirated with a short piece of wire stuck into one of the Airstream’s 12vdc light sockets. This afternoon Jim finally tackled permanent wiring and a neat new switched circuit for the LED light. Jim emptied the hundred or so pots and pans and empty Tupperware containers from above the dinette to allow removing the roof locker’s interior panels. The exposed bottom in the roof locker provided ready access to wiring for the existing three recessed halogen lights. And Jim easily installed the needed wiring to supply the new LED light. The fun part is a switch Jim added inside the roof locker recessed into the left (aft) end panel. This is a single-pole double-throw switch and allows us to select which light circuit will be powered when the Airstream’s light switch is on. In the new switch’s left position, the new LEDs light up the dinette. In the new switch’s right position (toward the shore power pole) the three recessed lights shine on the dinette. The light switch on the wall works normally, and we select with the added switch (hidden inside the roof locker) which dinette lights we’re operating. Simple and effective, the new switch setup keeps us using the best light for our power source. We don’t have much extra battery capacity and believe this will help us make best use of our limited power when boondocking. We like how this job turned out, and Jim wonders why he waited so long to do it. Thursday morning we iced the cake — we washed and waxed the trailer’s roof on our coolest and driest morning. Conditions were so nice we decided to start on just one end of the trailer. Before we knew it we had washed and waxed the entire exterior from the roof to the banana panels. It looked so great. And Thursday evening through Friday evening we had rains. Nothing like a nice cool rain to set the wax hard, right? And we don’t need to wax again until next February or March, whether it rains or not. We’re road-ready, and more than two weeks ahead of our departure from Kannapolis for points west. Many of the tasks are easier with Pop’s workshop area and Mom’s sewing area at their house. We’re accustomed to working wherever we are, and to have fully equipped work areas for our projects is really nice. We accomplished more in less time by organizing and working from a list.Making the project’s list worked very well for us — we were able to look forward to each day’s projects and look back on what we completed. Our travels begin September 7 and continue through at least October 20 upon our arrival in Mesa AZ for the winter. The maintenance and improvements we’ve completed may prevent untimely breakdowns and will help us enjoy fun travels instead of repair worries. Where better to celebrate a birthday than on Paradise Island, The Bahamas? Jim’s mom decided she wanted a special birthday we’d all remember. 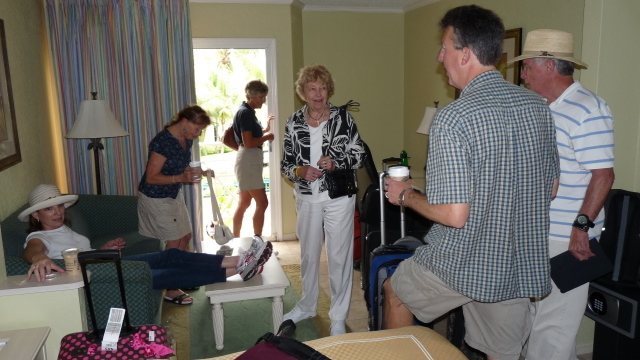 Jim, his brother and three sisters, and all the spouses joined Catie for nine days in June across the bay from Nassau, The Bahamas. Our direct flight from Charlotte was only a couple hours, a pretty short flight. We arrived at the modernized Lyndon Pindling International Airport, just as nice as the Charlotte-Douglas Airport we’d just left. And the adventure begins. 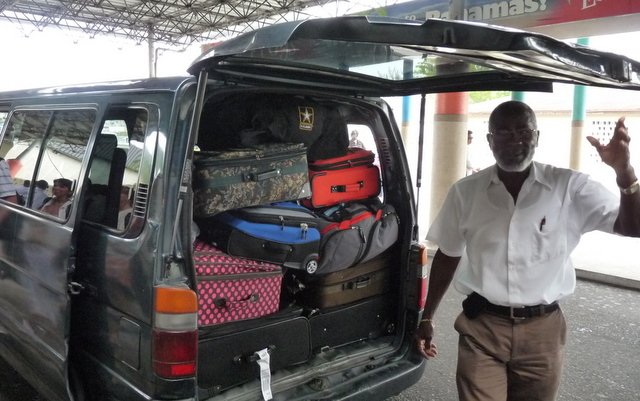 How do you get eight adults and lots of luggage from the airport to the hotel? We crammed all in a small minivan with fold-down jump seats and luggage piled to the ceiling. It was a good fit for the twenty minute trip to the hotel. We were early and couldn’t get into but one of our rooms so we stowed luggage in the one room. What do you do with one room? 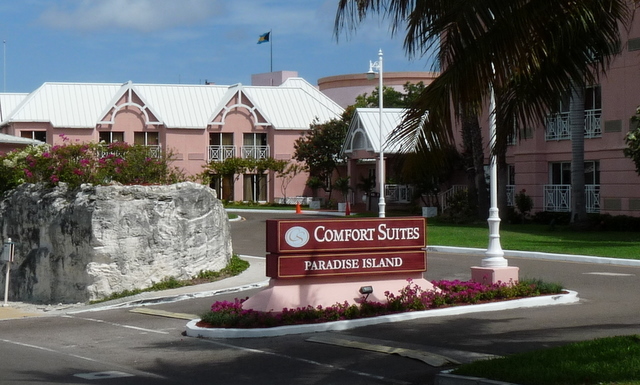 The grounds of the Comfort Inn on Paradise Island were very pretty, typical of a lot of places on the island. The hotel is bigger than it looks but only seemed crowded at check-in. The pool-side bar and breakfast bar weren’t crowded, what else matters? 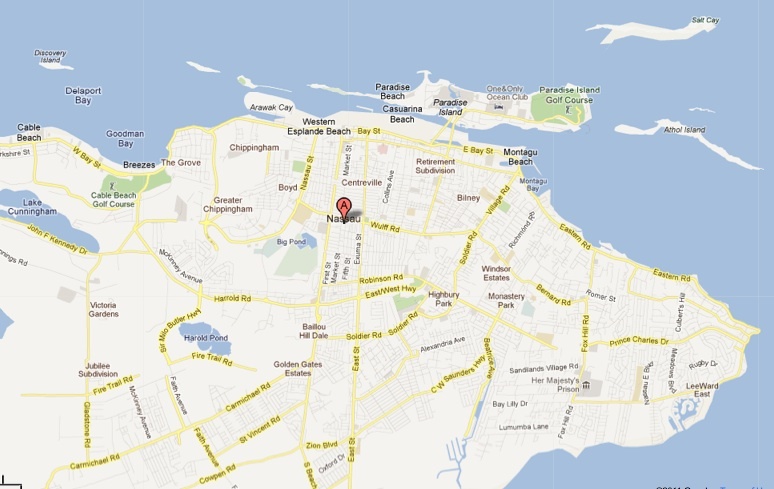 The rooms were clean and spacious and furnished with a refrigerator, comfortable bed, a table and a small sofa. 3. Free run of The Atlantis Resort amenities. Our group (eleven of us) informally met daily at breakfast, wandering in whenever we felt like it before heading for the beach or town. The buffet included eggs, sausage, bacon, bagels, cereal, fruit, yoghurt, juices, tea, coffee, and milk. And we met a little more formally each day for happy hour. The UNC Tarheels men’s baseball team were still in the College World Series so we watched a little of that, we discussed dinner plans for the evening, and we enjoyed Chrystal’s hospitality. 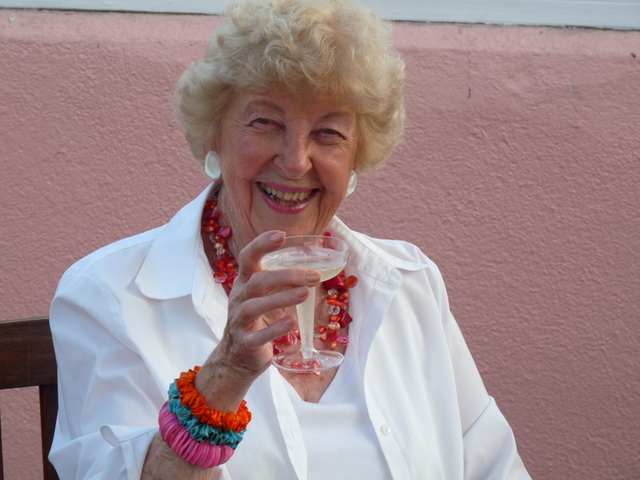 She ran the pool-side bar most afternoons and was a lot of fun, besides being very very good bartender. 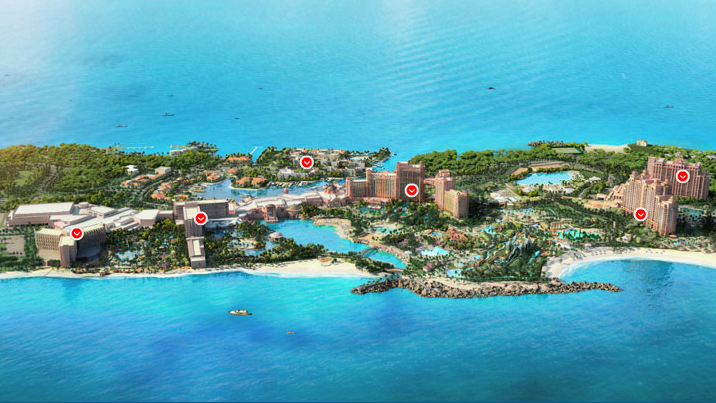 The Atlantis Resort amenity of interest for us is the 141 acre water park. Daily use fee is $110 per person unless bundled with your hotel stay. The Comfort Inn provided this for us without extra charge. So we spent every day somewhere in the water park. Five days we played doubles tennis on the clay courts and enjoyed free stroke clinics there as well. More than 20 swimming areas, including family pools, children’s pools, Goombay Water Slide & Baths, and lazy river for tube rides. Paradise Lagoon, a seven-acre saltwater swimming and water-sports area with snorkeling gear, kayaks, and pedal boats available for rent. Three miles of Atlantic Ocean beaches flanking entrance to Paradise Lagoon. Five waterslides built into a six-story Mayan Temple, including the Leap of Faith, a 60-foot, nearly vertical plunge running through a clear acrylic tunnel submerged in a shark-filled lagoon; a 48-foot corkscrew slide transporting tube riders through the Temple’s dark core; and shorter, gentler children’s slides connecting cascading pools. Sports center with six lighted clay and hard-surface tennis courts (surcharges); 27-yard, four-lane lap pool; fitness facility (surcharges) with free weights, cardio and weight machines, steam rooms, and workout studio for aerobics, spinning, kickboxing, yoga, and Pilates (surcharges). Dolphin Cay Atlantis, a 14-acre dolphin habitat, is one of the largest of its kind in the world. Guests can share in the dolphins’ playful shallow water antics or experience their speed and agility first-hand in the deeper waters. Aquaventure, a 63-acre waterscape, contains over 20 million gallons of water and features water slides, a mile-long river ride with rapids and wave surges, and special effects. Guests in inner tubes are propelled along by water escalators, waves, and water surges. Unlike traditional water slides that require the participant to leave the water and climb back to the start, AQUAVENTURE guests never have to leave the water as they are propelled back up the slide tower via water conveyors. How do I like my birthday in The Bahamas? We hope we haven’t lost you. 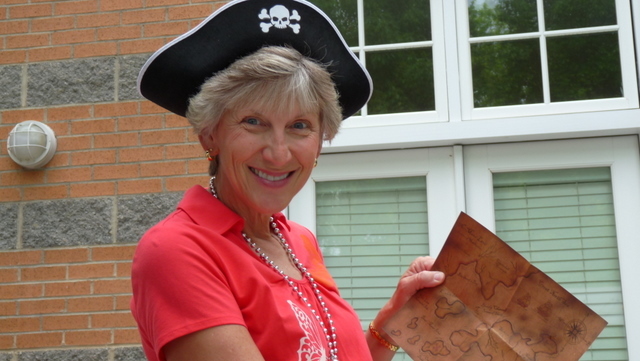 This post is really about the birthday celebration for Catie, Jim’s mom. Let’s see: spend days in beautiful Bahamian island surrounded by her children; free breakfast prepared daily near the hotel room; lunch on our own; happy hour with very nice drinks pool side; dinner out in nice restaurants on the harbor. This was a pretty nice get-together for everyone, and we think Jim’s mom enjoyed it as well as any of us. 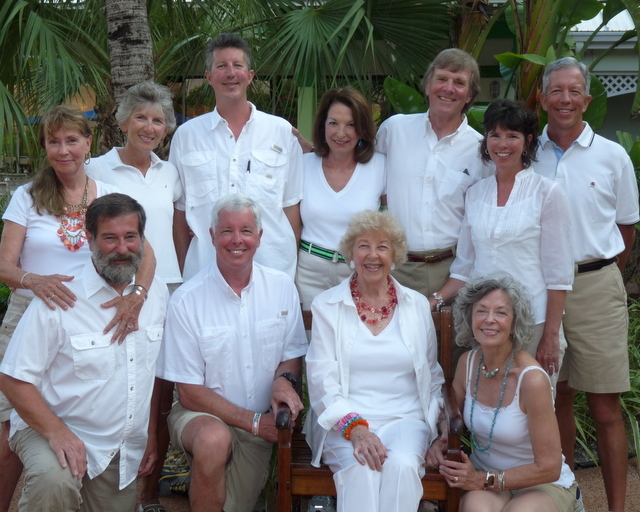 The trip was an incomparable chance for Jim and his siblings, all the spouses and Catie to spend nine days together in a beautiful and fun-filled setting. Thanks, Catie!